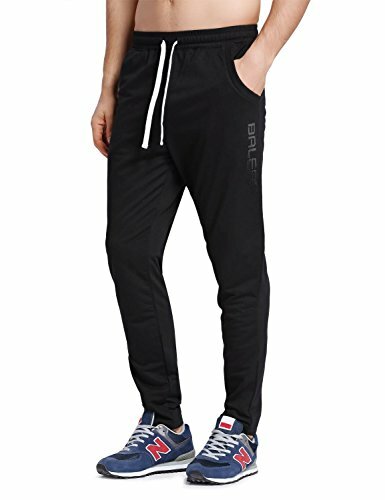 Baleaf Men's Casual Gym Fitness Trousers With Pockets can both be used as sports wear and everyday wear. Soft, quick-dry fabric provides a sweat-wicking base layer of support and low-friction performance. Slim fit design (tapered leg) flatters your curves and makes this a great layering piece. Perfect for running, training, jogging, sleeping, lounging, yoga, gym workout etc. in spring, summer and autumn. XS: Waist: 28.5"-29.5"; Hip: 34"-35.5"; Inseam: 28"
S: Waist: 30"-32"; Hip: 36"-38"; Inseam: 28.375"
M: Waist: 32.5"-34.5"; Hip: 38.5"-40.5"; Inseam: 28.75"
L: Waist: 35"-37"; Hip: 41"-43"; Inseam: 29.25"
XL: Waist: 38"-40"; Hip: 44"-46"; Inseam: 29.625"
XXL: Waist: 41"-43"; Hip: 47"-49"; Inseam: 29.75"